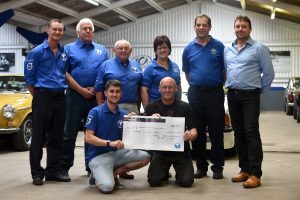 Kings Lynn & District Motor Club needs your (or your kids!) help! The club has successfully migrated most of it’s communication to e-mail, Facebook and its website, which is proving ever more popular, and the “management” of the website and other communication methods has been carried out very ably by Donna Dempsey (HUB) and David Smalley (Web). The club would now like to amalgamate the two roles and need a club member, or future club member, to carry out the role. The position will require about 10 minutes everyday to complete, probably less if you are a modern keyboard warrior, and would not require committee membership. It involves monitoring, and then collating, all of the different communication channels and making sure that information/articles are represented on all of our differing platforms, it might involve forwarding emails to the committee or club members, posting communication and articles on Facebook or updating the website, the idea being that all of our platforms show the same information at the same time and all of our members are kept informed of club events etc via the different media. It’s a position which will un-doubtably grow with time and is hugely important, sadly it carries no wage but any costs incurred will be reimbursed and you can make the role as big as you like which could be hugely rewarding. It would suit somebody who is familiar with Social Media and Web Updates with a bit of flair for marketing which helps keep our content accurate and exciting. I would be happy to discuss the position and it’s requirements with any interested people and of course will assist with what little training will be required. The club would like to find somebody prior to the AGM in March, If you can help or would like to know a little more about the role please give me a call on 01366 383352. Thanks to David Bell and team for organising this event. Thanks to all who supported this event and to Greg Bates for the use of his field.